This Expert Adviser is based on four methods computed through candlestick patterns and indicators like RSI, Stochastic, Moving Average and ADX. 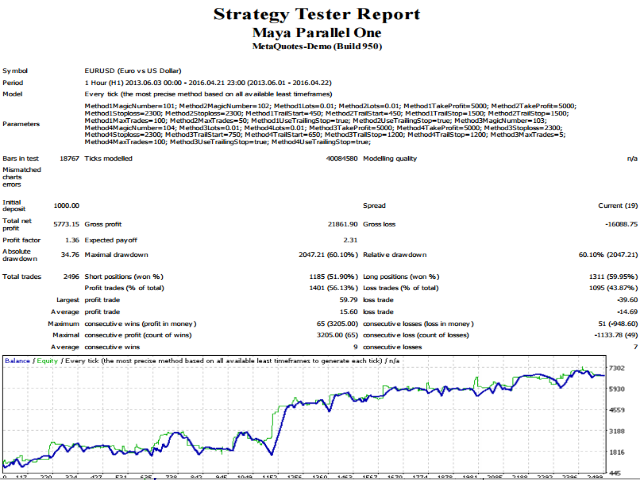 Each method places parallel trades based on actual base strategy. Expert Adviser works with ECN and 5 digit brokers only and has minimal effect of fluctuating spreads. All trades are executed based on long term plan and protected with Stop Loss. Each trading method looks for TP more then (100 pips - 5000 Pips) and stop loss of 230 pips. Indicators Used: Candlesticks , RSI, ADX, Moving Average and Stochastic indicators. Note: This EA Purely based on Long Term Strategy, Not for Short Term Trades. Does Not works for FOUR digit brokers. I'm starting to enjoy its benefits, thanks. Very Cool and All My trades are in Green ..